We had worked with Novelty Events before at a Palm Springs wedding and were excited when they invited us to participate in a styled shoot they were putting together right here in Joshua Tree. They put together an awesome shoot and we loved working with the photographer, Michelle Dudley. The couple who starred in this styled shoot, Ashley & Jordan were newlyweds, and so fun to work with! 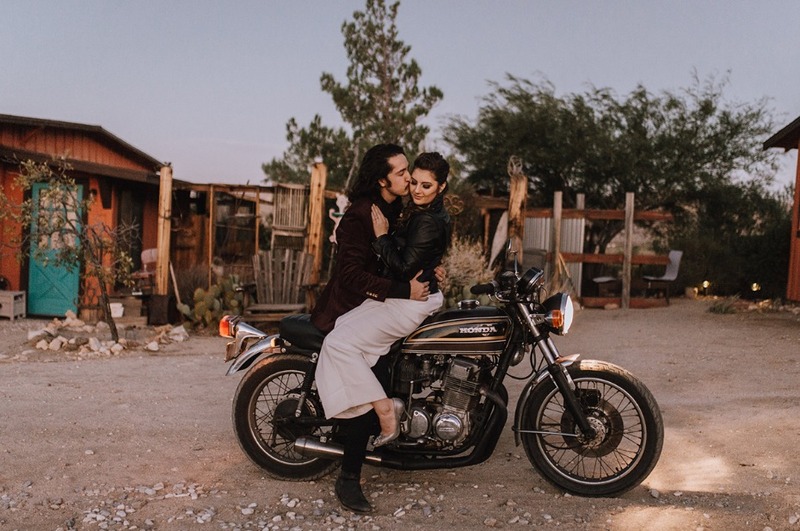 They brought their vintage motorcycle along and helped take the shoot to the next level. We wanted to inspire the modern day couple and show them they can have a rad elopement that is intimate and edgy, modern and stylish, easy and fun without the big production of a stressful wedding day. When it came to the venue, we chose the Desert Lily Inn Bed & Breakfast for a simplistic open-air ceremony design. We loved the ease of it also being a bed and breakfast and the newlyweds being able to immediately start their honeymoon getaway. We brought in black and rose gold celestial and geometric accents and rentals that complimented the modern and edgy vibe we were going for, but we also wanted a stunning bouquet and amazing floral installation to add to the contrast of an edgy design with delicate additions. We had beautifully crafted personalized vow books for the bride & groom to have as keepsakes along with a touching wedding video of the bride and groom saying their vows, dancing under the desert sun and getting away on their motorcycle into the sunset. If you enjoyed the film, be sure to head over to the full blog post on Wedding Chicks to see all the beautiful photos too.